4. Drink and Revel, Bears’ Gentry! 1. “Intro” – Bagpipe intro for the new album was written by my good ukrainian friend – Alexey Shkuropatski (bagpipe in F.R.A.M. and Mystterra). This composition was written in Moscow when Alexey was being on a visit to me. It is possible to say that the use of bagpipe in this case was a kind of the “test of the pen”. The test was successful and in future we will add a bagpipe to our future compositions. 3. “Fire-Mead” – this is a song about genius bear, that reached to steal the bottleger’s device from the village redneck and to begin making a home-brew made of honey. By a number of evident reasons village guys, armed by guns and pitchforks, tried to take their precious device back, but their brave attempt came to grief because of bears’ salt shells that arrived into rednecks’ brave asses=) Mysic and Lyrics by pan Zagloba. The guest musician is Alexandr Oleinikov – accordion (ex Kalevala). 4. “Drink And Have Fun Bear’s gently!” – it’s a kind of mosaic made of two ukrainian folk songs (“Oh, whose wild mint is it?” and “From Nigine to Priluki” and some riffes of my composition. The ukrainian part of the song was performed by Eugenia Sizova. The riffes of my composition acquired a fervent text about unlucky bearded imp flying into the sky because of pan Bear’s friendly punch. This part of the song was recorded by me in russian. 5.”Folk-n-roll” is a composition well-known to the listeners because of the same named internet-release. The difference of this version in comparison with the ep-version is re-recorded rhytm section. Our new guitarist Ilya Shukin brought into this song a new fresh beer blues. 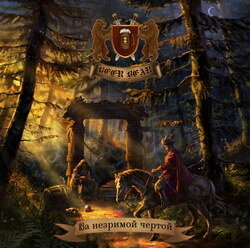 Music and lyrics by pan Zagloba. 6. “Beyond the invisible line” – the title song of the album. The reflection of polish knight on the way to the other side to the enchanted forest. As a matter of fact it is my reflections to some extent. The music of this composition was written by me in co-authorship with our ex-drummer Kirill Beard Kasatkin. The lyrics is mine. The composition is remarkable by a wide use of acoustic guitar and ukrainian bandura which parties was recorded by a guest of the album – Ivan Solncesvit Luzan (Tin’ Sonca). 7. “Holger Danske” – this song was written by me even in 2006. I was thinking for a long time in what style should i make it’s arrangement (folk metal or black metal) and accordingly in what project should i release it: Beer Bear or Top’. As a result the variant with Moonsorrow-like guitar riffs seemed to me more attractive and that appointed the destiny of this composition. This song based on an ancient danish legend about an old mighty warrior sleeping leaning on his axe and shield deep under the granite rock under the Kronburg castle in the Helsinger town (ShakeSpear had called this place “Elsinor” . He sleeps heavy until the time will come and his fatherland will be under attack. At that moment he will wake up and begin to shatter the enemies of his native land. The song is dedicated to my friends from “Sann Varing” historic club. KAWIR new album “Isotheos” out on September!